Richard Alpert was together with Timothy Leary the public face of the so-called Harvard psychedelic club in the early 1960s. As academics at Harvard, Leary and Alpert championed the enlightenment enhancing potential of LSD. Leary's career went into a tail spin when his tenure at Harvard was terminated for providing LSD to students and he was subsequently jailed. However Richard Alpert's later career was more auspicious; he travelled to India in 1967 and met his guru the Hindu mystic Neem Karoli Baba, who gave him the name Ram Dass. In 1971 Ram Dass wrote Be Here Now, a book that became one of the most influential counterculture texts and has sold more than one million copies. Hallucinogens have many connections with classical music, starting with Berlioz’s opium inspired Symphonie Fantastique. Aldous Huxley, whose circle included Igor Stravinsky, Christopher Isherwood, and Charlie Chaplin, told a colleague that; "If you ever use mescaline or LSD in therapy, to try the effect of [Bach's] B-minor suite". There are also more tenuous connections between composers and LSD, and the unlikely link between Elgar and hallucinogens was explored in an earlier Overgrown Path post. There is another similarly tenuous link between a composer from Elgar's time and the Harvard psychedelic club, and that fascinating link leads us down today's overgrown path. John Foulds was born in 1880, and his involvement with Indian mysticism reached a wide audience through the 2008 performance in London of his World Requiem. Reckless hyping of this convoluted and flawed work inflicted needless damage on Foulds' reputation. But, as discussed in an earlier post, Foulds wrote some striking and overlooked music that was deservedly championed by Sakari Oramo in his time with the City of Birmingham Symphony Orchestra - audio sample here. John Foulds and the Harvard psychedelic club now converge, because one of the works that Sakari Oramo recorded with the CBSO was Foulds' the 'Song of Ram Dass'. 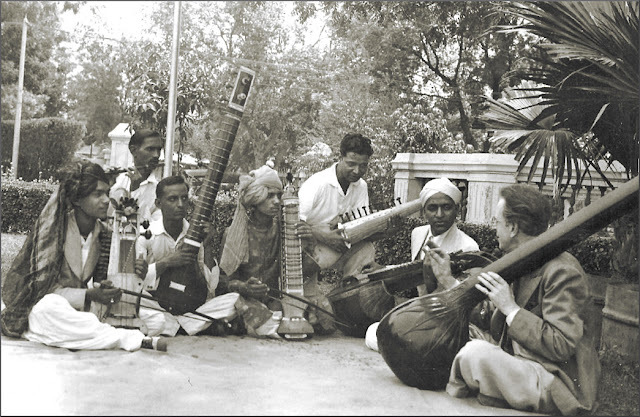 Like Richard Alpert, John Foulds was drawn to India, and in 1935 he moved there and became director of European music for All-India Radio in Delhi; the photo above shows Foulds in 1937 with his embryonic Indian European Orchestra. But sadly his pioneering trans-cultural work was cut short when Foulds died of cholera in Calcutta in 1939. Which is why the link between John Foulds and the Harvard psychedelic club is tenuous: John Foulds wrote 'Song of Ram Das' in 1935, and Richard Alpert/Ram Dass was only born in 1931. However, although the link is tenuous there is some substance - sorry about the pun - to it. Malcolm MacDonald's definitive 'John Foulds And His Music' describes the 'Song of Ram Dass' as a "tranced adagio", and explains that the short orchestral work is based on a tune in Indian style provided by the composer's second wife Maud MacCarthy, who was a major influence on Foulds' mystical path. However, Malcolm MacDonald offers no explanation for the song's title. My own research has uncovered two explanations for the title. The published score for 'Song of Ram Dass' explains the title as a reference to Swami Ramdas, a revered Hindu teacher who lived from 1884 to 1963. Which is perfectly plausible, and paths converge at this point, because Richard Alpert/Ram Dass has written: “In 1970 I came upon the writings of Swami Ramdas... and there it was, so innocently presented, a testament to the possibility that by remembering Ram (God), one’s life could be transformed, totally transformed.…”. However Adrian Corleonis gives a conflicting interpretation of the title, explaining that: "The title [Song of Ram Dass] refers to a 16th century Sikh guru, not to be confused with the Harvard professor who appropriated his name", presumably referring to Sri Guru Ram Das ji (1574- 1581). As explained above, Adrian Corleonis is wrong in stating that Richard Alpert appropriated the name of a Sikh guru, but his reference to confusion over names is pertinent. Header photo is very the John Foulds Estate. No review samples used in this post. Any copyrighted material is included as "fair use" for critical analysis only, and will be removed at the request of copyright owner(s). Also on Facebook and Twitter. This is a fascinating post, as always, pli. However, I'm left uneasy by the notion that we should question everything (very convenient, as was the so-called counter-culture movement, for late capitalism!). If your loved one asks, "Do you love me?," you know you're in trouble!